Dr. Jossart performs approximately 160 sleeve gastrectomies per year. He sees patients in San Francisco and Novato each week for office appointments. 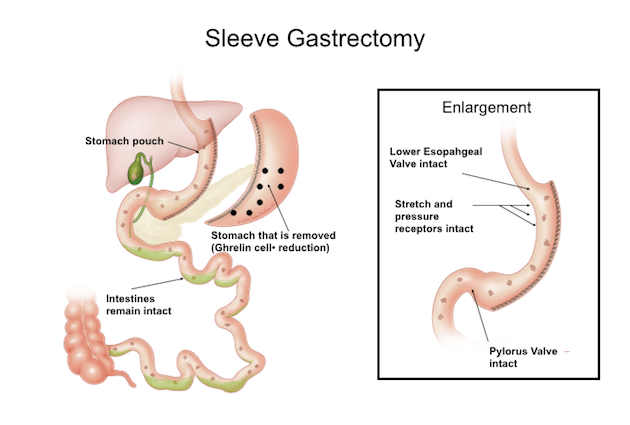 What is a Sleeve Gastrectomy ? During the Sleeve Gastrectomy, the part of the stomach that allows us to eat large volumes of food is removed – laparoscopically. This part of the stomach also contains Ghrelin: the cells that produce the hunger hormone. The tube-shaped stomach that remains include the nerve receptors that sense stretch, pressure and fullness, as well as the pylorus: a valve at the bottom of the stomach that controls the emptying of the stomach. The combination of a smaller stomach and less Ghrelin significantly reduces the appetite and leaves the patient feeling full longer. The Sleeve Gastrectomy is a purely restrictive operation. There is no intestinal bypass and there is no foreign body or band. Who is a Candidate For The Sleeve Gastrectomy ? Sleeve Gastrectomy is an option for almost all patients. Those who have previously considered banding will be pleased to know that weight loss with the sleeve Gastrectomy is equal to or better than weight loss with banding procedures. Moreover, the Sleeve Gastrectomy eliminates the issue of having a foreign device (the band) with potential to slip or erode in the body. Nor does it require ongoing “port adjustments.”Those who have considered the Roux en Y Gastric Bypass will be happy to know that the Sleeve Gastrectomy provides comparable weight loss and diabetes resolution, but without the potential problems associated with intestinal bypass procedures. 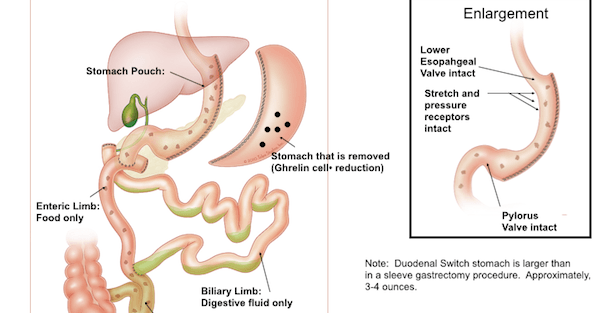 The Duodenal Switch has superior weight loss and diabetes resolution compared to the Sleeve Gastrectomy, but because of the higher risks involved, it is generally reserved for the heaviest patients with more severe diabetes. The Sleeve Gastrectomy provides a weight loss range of 50 to 150 pounds. It can be offered to patients with a BMI almost as low as 30 kg/M2. It can also be offered to patients who need to lose more than 150 pounds and is a safer option than other procedures. It is difficult to lose more than 150 pounds with just a Sleeve Gastrectomy because there is no intestinal bypass to augment weight loss. The operation itself generally takes only one to two hours and requires one night of hospitalization. Recovery time ranges from a few days to a few weeks. There is a high satisfaction rate among patients who have the sleeve gastrectomy. Most find themselves able to maintain good control of their cravings, hunger and portions with very few dietary side effects. The weight loss generated by the Sleeve Gastrectomy may not be adequate for those with a BMI greater than 50 or 55 kg/m2. The Roux en Y or Duodenal Switch may be slightly better for the higher BMI group. Also, while most patients choose the right foods after surgery, some may not and the potential for inadequate weight loss due to poor food choices does exist. This tends to be true for all of the operations. Patients considering a Sleeve Gastrectomy should be aware that the removal of a portion of the stomach is permanent. Also, there is the potential for complications such as leaks, reflux and inadequate weight loss. These problems are minimized by more experienced surgeons who are able to make a small enough stomach, repair reflux problems and maintain proper management of the staple line. Dr. Jossart performs the Sleeve Gastrectomy with the smallest possible pouch size (32 French Bougie tube) to ensure that his patients achieve the greatest possible weight loss. Leaks refer to a disruption in the staple line and often require several weeks of hospitalization in order to heal. His current technique of using reinforcing sutures may have eliminated this problem—although it still remains as a known risk of the procedure. Dr. Jossart is a Course Director and Proctor for the Sleeve Gastrectomy. He is also a Center of Excellence or Center of Medical Experience Surgeon with Blue Cross, Blue Shield, Aetna, Cigna and United HealthCare. He is also a provider for Brown and Toland, Sutter Select and most other insurance companies. 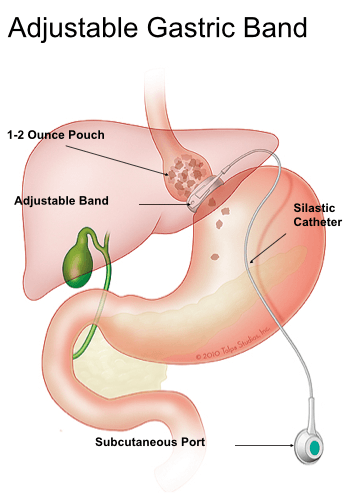 Gastric Banding is a laparoscopic procedure that reduces the size of the stomach. It is also the most common restrictive surgery. The gastric band is a soft plastic ring that is placed around the top of the stomach, creating a small pouch above the band and narrowing the passageway to the stomach. A port implanted under the skin next to the belly button is used to inflate a balloon inside the band with saline, thereby adjusting the entry to the stomach to limit how much one can eat. The surgery is minimally invasive, and will consist of 1-5 small surgical cuts in your abdomen. The surgery consists of placing a band around the upper part of your stomach, and separating it from the lower part of your stomach. The normal time for these procedures ranges from 30 – 60 minutes. Who is qualified for the Gastric Banding Procedure? Patients who have a BMI over 40KG/M2 are accepted patients for this procedure. These are patients who are 100lbs or more overweight. Exceptions are made for patients with a BMI over 35, but have serious medical conditions as a result of their obesity. Contact Dr. Jossart’s office for any questions regarding qualifications for any procedure. Can be reversedIn 2013, Dr. Jossart’s most common band operation was Band removal and conversion to Sleeve Gastrectomy. He offers this to patients with band complications or weight loss failure with most insurance approving of this operation. The gastric bypass has been performed for over a century for ulcers, tumors and other stomach problems. It was adapted to treat obesity in the 1970s and the first laparoscopic surgery was performed in 1994. It quickly became the most common operation worldwide for the treatment of obesity. In 2008, 75% of all weight loss procedures in the United States were gastric bypasses. In 2013, less than 50% of procedures in the United States were gastric bypasses. The procedure is very effective, but since the insurance companies started approving the sleeve gastrectomy, many patients choose it over the gastric bypass as it has a similar weight loss and diabetes resolution, but a lower complication rate over time. The Gastric Bypass is a laparoscopic procedure that changes how the stomach and small intestine handle the food you eat. The effects of the Gastric Bypass involve. Who is qualified for the Gastric Bypass? The gastric bypass is generally considered when your BMI is above 40Kg/M2 and are considered to have an extreme case of obesity. Exceptions are made for people with a BMI over 35 when severe medical problems are precedent. This involves cases like disability, life threatening diseases, or type-two diabetes being hard to control with diet and medicine. 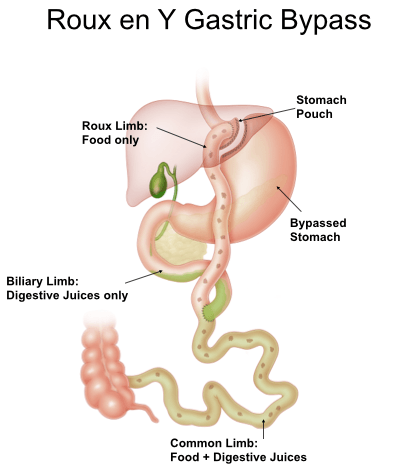 How is the Gastric Bypass Procedure done? The gastric bypass surgery involves stapling the stomach into two parts, a small upper section and a large lower section. A small, 1-ounce pouch—about the size of an egg—is created at the top of the stomach. The rest of the stomach is stapled off preventing food from entering it, but allowing digestive juices to empty from it into the small intestine. The small stomach pouch is then connected to a limb of intestine (the Roux limb) with a very tight connection. Patients are very restricted due to the small pouch and the small outlet. The process of splitting the intestine into two limbs also separates food from digestive juices and limits the number of calories absorbed. It is the intestinal bypass part of the procedure that can help achieve a better weight loss but it is also the intestinal bypass that yields a higher complication rate over time (intestinal obstructions, ulcers, nutritional deficiencies). The Duodenal Switch is the most powerful weight loss operation – it has the highest rate of curing diabetes and achieving the most weight loss. It is rarely performed due to technical difficulties, which are accompanied by more challenging side effects and complications. The procedure involves removing part of the stomach (up to 70% of the stomach). Who is qualified for the Duodenal Switch? Only patients who exhibit signs of both extreme obesity with a BMI over 50, which is also causing severe medical conditions qualify for the duodenal switch procedure. How is the Duodenal Switch performed? The intestines are bypassed for a greater distance than in the gastric bypass thereby allowing for better weight loss, but possibly more side effects (bloating, diarrhea, nutritional deficiencies). This procedure can be staged. This means the sleeve gastrectomy can be done first. By limiting the operation to just the stomach, the risks are reduced. In addition, the patient can be followed for 6 months to 2 years and if weight loss is not adequate or diabetes persists, then the Second Stage Duodenal Switch can be offered. Doing the intestinal part of the operation months or 2 years later reduces the risks, plus, only those patients who need the entire Duodenal Switch would actually be proceeding with it.